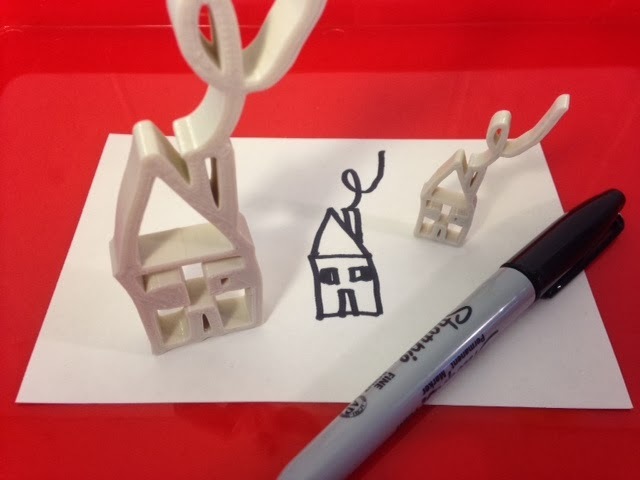 This design was inspired by DesignMakeTeach's excellent post Sharpie to 3D Print in 30 Minutes on his blog designmaketeach.com. Such a fantastic idea for introducing someone to 3D printing and for helping kids make simple prints! I wanted to take Shapeways out of the equation so I found a way to do the conversion step with my two favorite free and easy tools, Inkscape and Tinkercad; see the instructions below. The design we chose to work with was a picture of a house that C drew. It was so great to see his drawing actually come to life and even stand up! Settings: MakerWare .3mm/low with a Replicator 2 in about 30 minutes for the large one, and 10 minutes for the small one. 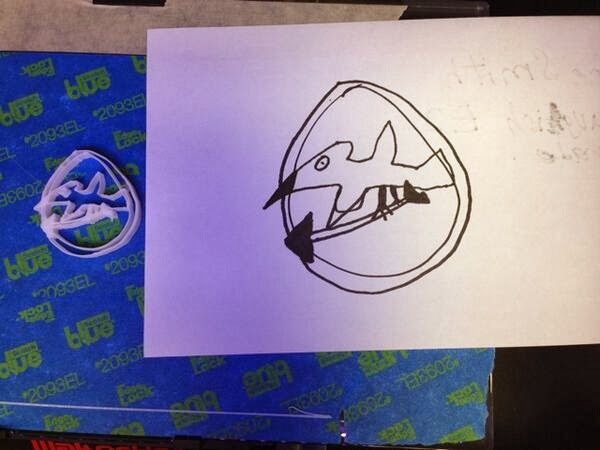 Technical notes, short version: Draw on paper with a Sharpie, take a photo, change to bitmap and save as an .svg file in Inkscape, load into Tinkercad, download as .stl and print. Technical notes, long version: Since this project is so good for someone very new to 3D printing, in this long version I'm going to go through the instructions as if you haven't used Inkscape or Tinkercad very much before. But it's easy, I promise! Take a photo of the drawing with your camera or phone. I found that things work best if I don't use flash but I do make sure that the drawing is very well lit. Open the photo in Inkscape and select the drawing with the arrow tool in the upper left. It will select the entire rectangle. From the "Path" menu in Inkscape, select "Trace Bitmap". The default options work well, which means you should have "Brightness cutoff" selected and set to Threshold 0.450. Hit "Update" and you should see the drawing appear in the small Preview window. It might not look that great in the Preview window but that is okay. Select "OK" and then close the "Trace Bitmap" window by clicking on the red button in the upper left. Save your file in .svg format. Make sure that you also change the extension of your file to .svg; this might not happen automatically. Open a new model in Tinkercad and open the "Import" tab at the top of the right column menu. Select "Choose File" and go find the .svg file you made. I suggest setting the Scale to 30% and height to 10mm. That will make the larger size of model that you see on the left in the photo above. Scaling to 15% and setting height at 5mm produced the smaller model in the photo. If you want to use Tinkercad to modify or add to your drawing, now is the time to do that. For example, if you don't want to worry about the connectivity of the original drawing then you can add a back to the object at this step. DesignMakeTeach had a great suggestion for how to add a perfectly-shaped backing to your drawing on this Twitter post. Sure, it's obvious NOW, but it wasn't until I looked at that Tweet. Export your model from Tinkercad by selecting the "Design" dropdown menu and choosing "Download for 3D Printing", and then "STL" format. You'll have to close the "Download for 3D Printing" window after you do that; for some reason it does not close automatically. Now you can use a 3D printer to print your .stl file. If your original drawing had a flat base then your model will probably stand up on its own! Send us your pictures of printed Sharpie drawings and we'll post them here!